There are many different ways to make yogurt. As long as you fulfill a few conditions, how you want to actually implement the process is largely up to you. 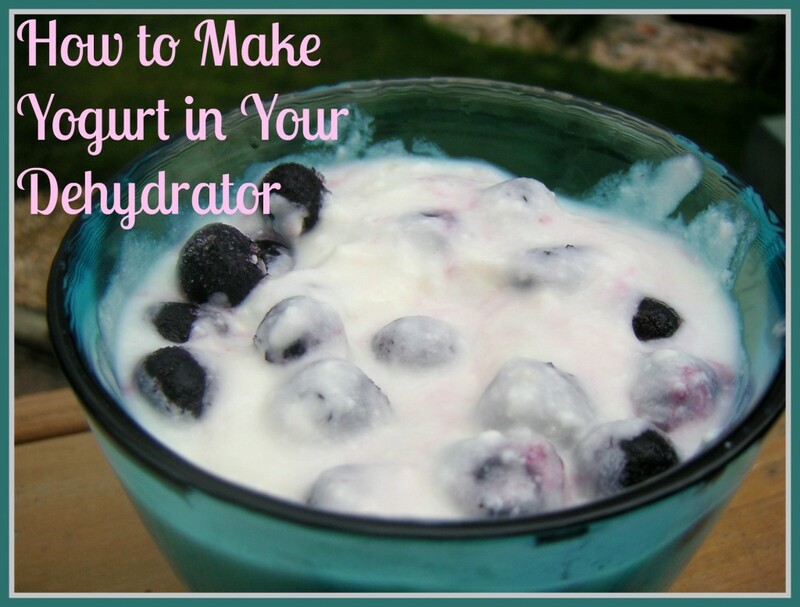 Today I want to share my favorite method: making yogurt in my dehydrator. Although making yogurt is one of those things that can seem really intimidating (it was for me, at least! ), once you get the hang of it it’s really a simple process. This recipe is specifically for “GAPS yogurt.” All that means is that the yogurt is fermented for twenty-four hours in order to give the bacteria enough time to consume all of the lactose in the milk. If you don’t need lactose-free yogurt, feel free to ferment your yogurt for a shorter period of time. Here is my basic method, followed by a few notes to explain why I do particular things the way I do. 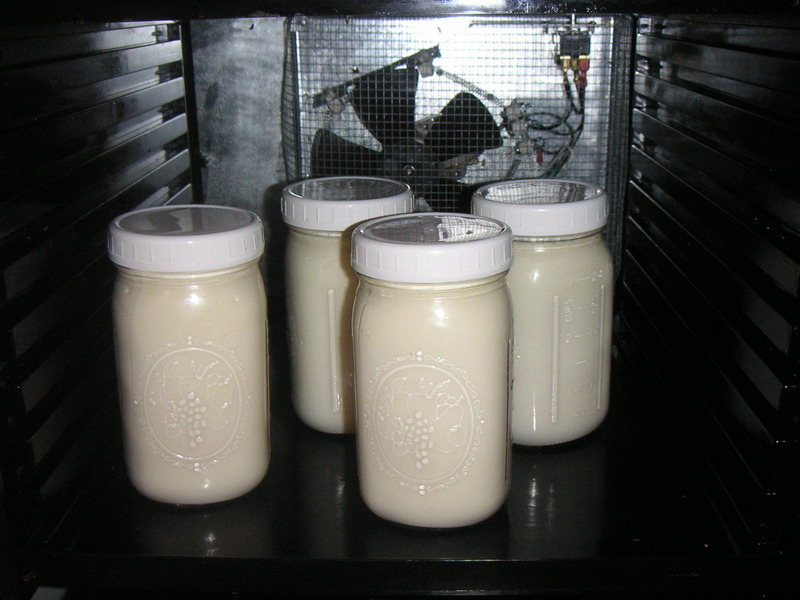 Pour the milk into four clean, quart-sized mason jars, leaving a couple of inches of airspace at the top of each jar. Line the bottom of a stockpot with a dishcloth or small towel. (This helps keep the jars from rattling.) Place jars into the stockpot. Fill the stockpot with water until the water level is a few inches beneath the rim of the jars. Clip a thermometer to the side of one of the jars so you can measure the temperature of your milk. Heat the pot over medium heat until the water is boiling, then turn it down to a simmer. Continue heating until your milk reaches 180 degrees Fahrenheit. 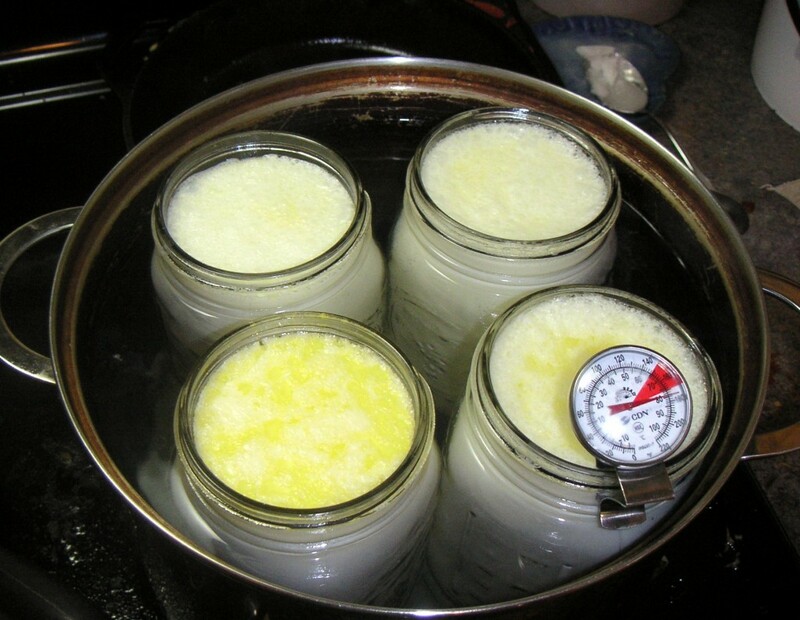 Remove the jars of milk from the pot and allow them to cool on the counter. If you're busy and don't want to deal with the milk for an extra long time, you can slow the cooling process by leaving the jars to cool in the hot water. Check on the milk regularly until it cools down to about 110 degrees Fahrenheit. If you're using yogurt as your starter, add two tablespoons of yogurt to each quart of hot milk. Stir each jar well to combine the starter yogurt with the milk. If you're using a powdered yogurt starter, spoon out a tablespoon or so of hot milk from one jar into a smaller jar. Add your powdered yogurt starter to the smaller jar. (Consult the package of the powdered starter to find out how much starter for one quart of yogurt.) Stir the milk and starter vigorously to dissolve the powdered starter. Add the milk/starter mixture back to the jar and mix to combine. Repeat for the next three jars. Cap jars, then place them into your dehydrator. Set the dehydrator at 115 degrees. Allow the yogurt to culture in the dehydrator for twenty-four hours. After twenty-four hours have elapsed, remove jars from dehydrator and store in the fridge. Although this recipe makes a gallon of yogurt, you can really make as much or as little as you want. I like to make a gallon at once so I don’t have to repeat the process for a while. I buy organic, grass-fed, non-homogenized whole milk for this recipe. Raw milk would also work, but I pay $13.20/gallon for raw milk here so I only use it for my kefir. Any other type of commercial milk will work as well, of course, but I’d see if you can possibly find/afford grass-fed milk as your yogurt will have a lot more nutrients than if you make it with grain-fed milk. I’m not really sure how long the pre-incubating part of this process takes as I’ve never actually measured it. I find it works well to work on something else nearby while heating and cooling the milk so that I can check on everything periodically, but for the most part you won’t need to devote your full attention to the process. I don’t know if dehydrators vary in temperature at all, but to be safe you may want to take some extra precautions if you’ve never used your dehydrator for yogurt before. I’d recommend sticking a thermometer in your yogurt a few times while it’s culturing to make sure that the temperature is right. The yogurt needs to be between 90 and 110 degrees for incubation to occur. Our favorite way to eat yogurt is topped with some frozen blueberries or other frozen fruit. (Fresh fruit would probably also be delicious, but we like the frozen fruit because it gives the whole thing an icy texture.) You can also add it to a smoothie or just eat it plain. Still Scared to Try Making Yogurt? If you still feel intimidated about making yogurt, I highly recommend checking out Kitchen Stewardship’s yogurt post. Her highly detailed notes and pictures were what finally got me to start making yogurt even though I was really nervous about the process. Do you make your own yogurt? What’s your favorite method? Thanks Meghan, this looks so easy! I have the internal debate - buy the yogurt maker or just go for the dehydrator. Is your dehydrator the 9-tray? Just for grins: I tried a home rigged light in a cooler - with thermometer inside. I am pretty sure it got too hot and my yogurt separated. Yes, I have the 9-tray. I love it! It's great that it's useful for so many different things. How long does the yogurt typically last? I'm not sure, Jessyka. You could probably find out by Googling, though. I have kept mine for more than two weeks and never had it go bad on me, for what it's worth. I made yogurt in my new Excalibur and it got too hot at 115 degrees. So then I read information saying to set it to between 95 and 100 degrees (it tends to run about 10 degrees warm). My first 3 or 4 batches came out just fine. But my most recent 4 batches have all separated and had to be thrown out! UGH! Also did a sour cream that separated and had to be thrown out. And I've had 2 batches of each have crunchy pieces in it. I don't know what I could possibly be doing wrong. Even tried new starter yogurt each time and different brands. I'm at my wits end with doing GAPS and not having yogurt or sour cream turning out. I don't know if the dehydrator being in our basement and the temperature fluctuating down there at this time of year (anywhere between 60 and 68) is impacting things. I have done a lot of troubleshooting and batch after batch is not turning out. I dehydrated 2 batches of different nuts recently and they took around 36 hours to get "crispy" rather than the approximately 12 to 24 hour time frame. I have been making yogurt for many years now. Initially I used a yogurt maker that had little cups-but it was not enough for my family. Now I make 4 litres at a time. I heat the milk in a pot, let it cool add milk powder (this makes it super creamy and thick-like greek yogurt) and the yogurt culture. I heat my oven-at the lowest setting it can go to--then turn it OFF. I heat a large towel and a cast iron frying pan in my oven for a few minutes and then put my pot in the cast iron frying pan and wrap everything up in the towel and place it in the oven. I turn ON the oven light and leave everything for the yogurt culture to do its stuff and presto! I have yogurt delicious and creamy. I leave it in the oven for approximately 8 hrs, unless I forget about it or get busy. I have left it in for 12 hours sometimes. To keep the milk from sticking to the pot? Try rinsing it in COLD water before adding the milk. (pour in cold water, swirl it around and dump it out) Do NOT dry the pot, just pour in the milk you are using. Not sure why it works but it definitely helps. Thanks for the tip, Dawn! I will try it next time. I'm reading this recipe cuz it says it's lactose-free yogurt. I'm not afraid to make yogurt, but I am afraid of eating it. I'm very intolerant of lactose, will have a lot of pain if I do eat even the smallest amount of lactose. Has any severely lactose intolerant people tried this recipe with good (and pain free) results?